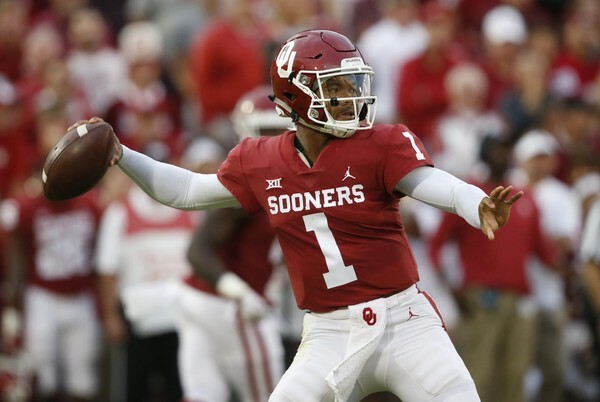 The brilliance of Oklahoma’s offense is the way that head coach Lincoln Riley thinks outside of the box to build counters or complementary plays based off of their main concepts. There are generic chains of complementary plays that every team runs. For example, teams that run outside zone all should have the outside zone boot in their playbook. Riley goes beyond the generic complements to create his own. As a result, Oklahoma possesses a playbook full of new ideas that build off of old ideas. It’s one thing to have great ideas, but they have to be able to work on the field. This season, it seems like everything is working for the Sooners. For example, one of the staples of the Oklahoma run game is the F-counter in which the backside guard will pull and kick out while the full back pulls from the backside and leads into the hole. On the play, the fullback pretends to pull before turning back around to block the end. The backside guard pulls and blocks the end on the other side, which gets the defense to flow in that direction. The center makes the most important block on the play. He initially steps right like he’s going to help on a double team before releasing to the second level, almost like he would on a screen, in order to cut off the second-level defender. Against a “tite” front, the Sooners also run counter and power plays in which the guard stays in to block the 4i-tech defensive tackle and the tackle pulls to lead in the hole. This is because it’s much tougher for the backside tackle to reach the 4i-tech than it is for the guard, who has a much better natural angle to block the defensive tackle. Here, the Sooners run a power concept with the aforementioned blocking scheme with a bubble screen option. Sooners quarterback Kyler Murray reads the apexed linebacker, who left the box to defend the screen—leaving a six-on-six situation, which is advantageous for the offense. The fullback is responsible for the end on the play. The defensive end pushed him too far inside but Murray was able to bounce the play outside with his world-class speed. Riley came up with a play-action concept off this scheme, which is extremely hard to defend. When power and counter plays are working, second-level defenders will fill and flow faster when they see a pull. In the clip above, Oklahoma used the same blocking scheme but pulled the fullback from the backside to make it look like he was going to block the end as he did on the QB power play. However, instead of kicking out the end, he turned up field for a pop pass. The offensive line is in a full slide protection to the left. The pulling tackle is responsible for blocking the end that is left unblocked by the fullback. The running back looked like he ran the wrong way on the mesh so Murray ends up faking the ball to nobody. However, the pulls by the fullback and tackle were enough to get the defense to flow and step up towards the line of scrimmage, allowing the pop pass to get behind them. Almost every high school has some form of counter in their playbook. The pop pass can be run with normal counter action where the guard kicks out while the fullback leads into the hole. Linebackers will still step up to meet the “pulling” fullback, which could give the fullback a step or two of downfield separation. Instead of just stealing these plays, coaches should be inspired to think of other unconventional counters or complements for their base concepts. Oklahoma is able to surprise their opponents with new concepts because Riley seems to constantly think of new ways to complement his base concepts. Try not only to emulate Riley’s plays, but try to emulate his way of thinking.